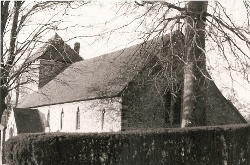 A small C17 church, altered in 1873, with mediaeval features that probably come from the nearby college of canons. The canons of South Malling administered the deanery of the Archbishops of Canterbury, which extended to the Kent boundary. Canons are mentioned in Domesday Book (2, 1) and after a re-foundation in 1150 (6 p130), the college lasted until it was dissolved in 1545, when the Crown acquired the advowson (2 p82). It would be normal for the college to have made provision for parish worship, but it is uncertain what form this took. Earlier writers have assumed that the parishioners used the church or chapel attached to the college, which is generally thought to have been on the site of the present C17 house known as Malling Deanery, which incorporates earlier, possibly C16, work. However, Nicholas Antram cites a map of 1824 by W Figg (BE(E) p627) which appears to show the present church on the site of the chancel of a larger cruciform one, though this has not been confirmed by excavation. A church of this kind seems more appropriate for primarily collegiate use, rather than parochial, since it would allow for multiple altars at which individual canons could say mass. Assuming that the college was on the site of the Deanery, the positioning of the mediaeval church here would have put it at some distance from the main buildings. Colin Brent (p206) argues that any earlier parochial church is likely to have stood here and the main question is whether there were separate churches for college and parish. At all events the church used by the college is unlikely to have outlasted its demolition in 1555 (ESRO Par 419/7/4/3), for brief details recorded shortly before its dissolution (1 p179) indicate it was in poor repair. It is said to have been aisled with a ‘stepyll’ and there is nothing that hints at a cruciform plan as suggested by Figg. Any previous separate church for the parish appears to have disappeared as well, leaving nowhere to worship, though the graveyard is said to have remained in use. In 1595 some parishioners at least were worshipping at Hamsey (Brent ibid) and others probably attended church in Lewes itself. John Stansfield, a successful Lewes merchant and sympathiser with the Puritans, bought the estate in 1623 and built the present church. Its site is on the other side of the lane from the house, whether or not the previous one had been here. In 1628 his grandson John Evelyn, the future diarist, laid the foundation stone and it was consecrated in 1632 after a debate about the necessity of this (3 p83). In plan, it is a rectangle with an unbuttressed west tower with a cap, little higher than the roof. Square openings close to the top may indicate that battlements were intended. 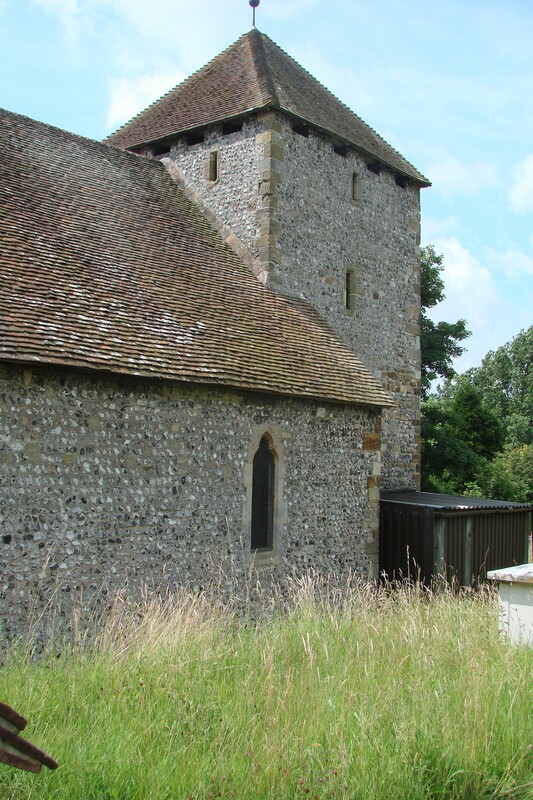 David Parsons (personal communication) has drawn attention to the presence of a plinth at the base of the tower and west wall only which raises the question of whether they are of different date to the plain rectangular body of the church behind. 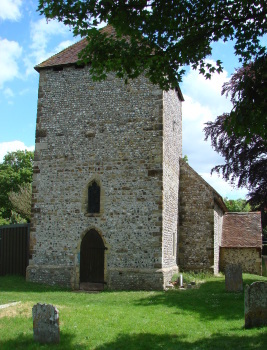 That could not be reconciled with a longer cruciform church as suggested by Figg’s plan and despite the presence of earlier stonework in the tower (see below), the simpler solution of a single build with structural variations seems more likely. The body of the church appears more straightforward. The undated Sharpe Collection drawing (1800?) shows apparently paired north windows with square heads and Quartermain’s drawing ((E) p179) shows the south side more clearly with what are probably similar plain square windows with mullions. 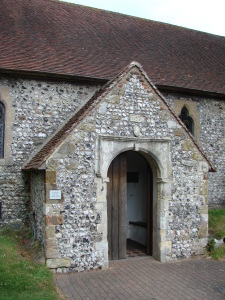 The south porch with a round-headed arch and doorway bears the date 1628 and a photograph of c1873 (5 p23) shows a rectangular east window divided by mullions and transoms into 12 parts. The presence of a plentiful supply of worked stone close by on the site of the college is likely to account for the re-use of considerable quantities of earlier material. 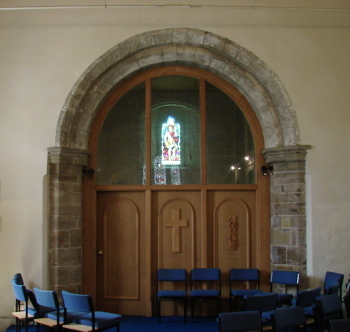 A trefoiled lancet in the tower and possibly the pointed doorway beneath are re-used C14 work and the semi-octagonal responds of the tower arch may also be C14, despite the round double-chamfered head. Reset each side of the east window is a C13 stiff-leaf capital. 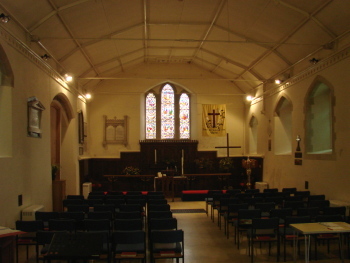 The interior of Stansfield’s church is a single space, plain and with low proportions that certainly remain unchanged from the building of 1632. Originally, there was a double-decker pulpit but no communion rails (5 p14), both signals of his Puritan beliefs. When re-pewed in 1836, ‘Mr Berry of Lewes’ (i e J Berry) added a west gallery (ICBS). This disappeared in 1873, when Philip Currey (B 31 p854) put wooden ribs on the plaster ceiling and replaced the windows with trefoil-lancets in the sides and an east triplet. His father, Edmund C Currey of Malling Deanery (CDK 1873 pt 2 p98), a diocesan lawyer, paid for much of the work, which came to £638 (KD 1899). In 1936 a vestry was added on the north side (5 p24). Most fittings were replaced by Currey, but at a refitting in 1989 (5 p25) there were considerable changes as the interior was in effect reversed with the altar at the west end. A plan to augment the seating with a balcony was not carried out and problems caused by the proximity of the repositioned altar to the main doorway led to its reinstatement in 2000 at the east end. The main survivals of the re-ordering are the chairs that replaced the pews and a screen in the tower-arch. Font: Small and octagonal. It is not easy to date but the size suggests it is C17, although Stansfield’s Puritan.sympathies might have made him reluctant to provide a font. 1. (East window) A Gibbs and Co, 1874 (B 32 p99). Medallions set in patterned glass. 2. (South nave, third window) J Powell and Sons, 1885, designed by H Holiday (Hadley). 3. (South nave, second window) C E Kempe, 1894. 4. (South nave, first window) J Powell and Sons, 1920, designed by C J Edwards (Hadley list). If this attribution is correct the window must have been made at a much later date as Edwards was only born in 1914. (www.stainedglassrecords.org retrieved 18/3/2013), but the date and the earlier authorship of the east window suggest A Gibbs and Co.
6. (West window) J Powell and Sons, 1892 (St Michael) (Order Book). 8. (Vestry) Heraldic glass by B Batt, 1936 (signed, but my thanks to Nick Wiseman for spotting this), commemorating the Silver Jubilee of King George V.
Monument: (North wall – formerly on the east wall) Dr Russell (d1759), the ‘Father of Brighton’. Small oval black marble tablet with part of the inscription in Greek from Euripides’s Iphegenia in Tauris, to be translated as ‘The sea washes away the ills of men’ (5 p17).